The Phantom's purple costume tends to stand out against his green jungle surroundings so much that I thought it might be fun to take a stab at making him blend in to his environment a bit here. Well... that's what I had in mind when I decided to take on sketching fellow St. Louisan, and creator of Mandrake the Magician, Lee Falk's "Ghost Who Walks". I may have gone a bit overboard on the foliage. What can I say? I like inking trees! This one is awesome! I always liked the Phantom. One of your best! And what a great character. I really dig the wraith-like depiction of the Phantom, Chris. Both visually and conceptually this presentation seems to make a lot of sense to me. Great inkwork as always, my friend. 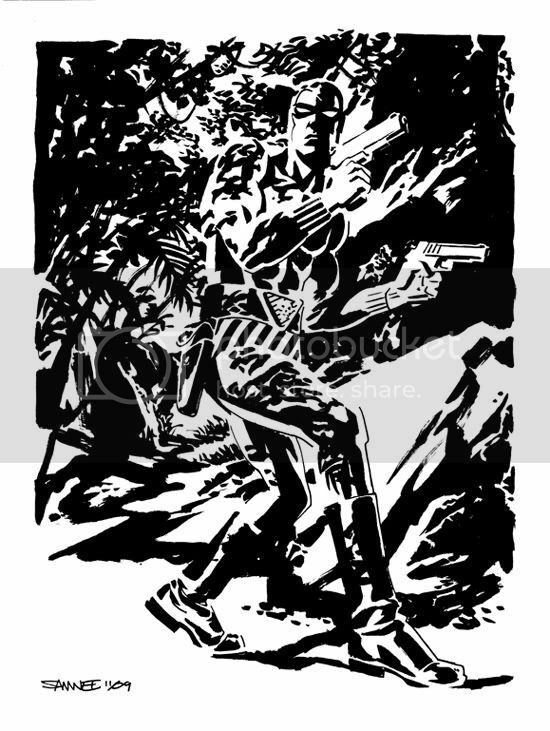 Man, your black and white style is prefect for the pulp characters and noir genre.